AnyGlove™-Can Really Make Your Favorite Gloves Touchscreen Friendly? Yep! OK, so we have to admit to a slight touch of cynical disbelief when we first heard claims that a small bottle of liquid could convert your favorite gloves to work with your phone or tablet touchscreen. There is no such thing as a pair of touchscreen gloves. We don’t care if you integrate little nubs, different materials or some fancy capacitive whosits, they’re not going to work. 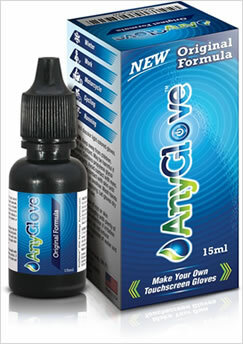 AnyGlove offers a liquid treatment that with just a few drops will make your glove tips touchscreen compatible. It works on most fleece, knit, synthetic leather and leather gloves. Does exactly as advertised. Love it. Just wish it dried faster. It can be a bit messy so make sure you let it dry before messing with it. AnyGlove Original Formula – Specifically created for knit, fabric and synthetic leather gloves such as winter, snowboarding, running, liner-wool gloves, and more. Specially formulated for leather, it works great on any type of leather glove such as motorcycle, work, equestrian and law enforcement leather gloves.